In August 2010 after over 18 months of trying to repair failing roads with traditional construction methods in rural Wetzel County, WV Chesapeake Energy decided to do something creative and green. On Brock Ridge Road near Wileyville, WV they began using Mechanical Concrete® ; an emerging construction technology that delivers a heavy duty road base while remaining permeable to rain and ground water. Mechanical Concrete® uses a cylinder to confine the stone road-base. The cylinder is made from a used auto tire by removing both of its sidewalls. Tire-derivedcylinders are a strong, economical and green product that creates a virtually indestructible cell when filled with limestone or other approved road building aggregate materials. 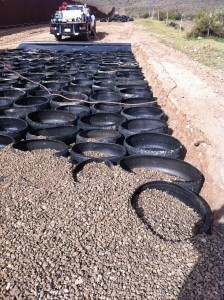 This reuse of waste tires complies with WVDEP Waste Tire Management Rules as a beneficial use. The resulting Mechanical Concrete® road base, made with an 8” to 10” thickness of stone, can withstand the volume and weight of stone, water, and fracking truck traffic from Marcellus Shale drilling operations and still remain permeable to the rain and ground water. used recently by WVDOH, District 4 as part of a technology assessment to stabilize highway shoulders on WV 279 in Bridgeport. Mechanical Concrete® was discovered by Samuel G. Bonasso, career consulting civil engineer and former WV Secretary of Transportation. He was granted a US patent on the technology. Bonasso said, “Mechanical Concrete® is a new way to hold stone particles together. It just keeps surprising me with its strength, durability and effectiveness. Mechanical Concrete® can strengthen these rural roads to withstand the Marcellus Shale truck loads and volumes and virtually eliminates base maintenance.